Indicate by check mark whether the registrant is a large accelerated filer, an accelerated filer, a non-accelerated filer, smaller reporting company, or an emerging growth company. See definitions of “large accelerated filer,” “accelerated filer,” “smaller reporting company, and “emerging growth company” in Rule 12b-2 of the Exchange Act. The aggregate market value of shares of the registrant’s common stock held by non‑affiliates of the registrant at December 31, 2017 was approximately $101,965,702 based upon the closing sale price on the Nasdaq Global Select Market reported for such date. As of the close of business on August 17, 2018, there were 45,917,531 outstanding shares of the registrant’s common stock. Portions of the Registrant’s Definitive Proxy Statement to be filed in connection with the 2018 Annual Meeting of Stockholders are incorporated herein by reference (to the extent indicated) into Part III of this Form 10‑K. This Form 10‑K contains forward‑looking statements within the meaning of the federal securities laws and the Private Securities Litigation Reform Act of 1995, which are based on management’s current expectations, estimates and projections. These statements may be found throughout this Form 10‑K, particularly under the headings “Business” and “Management’s Discussion and Analysis of Financial Condition and Results of Operations,” among others. Forward‑looking statements typically are identified by the use of terms such as “may,” “will,” “should,” “expect,” “anticipate,” “believe,” “estimate,” “intend” and similar words, although some forward‑looking statements are expressed differently. You should consider statements that contain these words or words that state other “forward‑looking” information carefully because they describe our current expectations, plans, strategies and goals and our beliefs concerning future business conditions, future results of operations, future financial positions, and our current business outlook. Forward-looking statements also include statements regarding our sales and growth expectations, our liquidity, capital expenditure plans, our inventory management plans, our real estate strategy and merchandising and marketing strategies. The terms “Tuesday Morning,” “the Company,” “we,” “us,” and “our” as used in this Form 10‑K refer to Tuesday Morning Corporation and its subsidiaries. •increased costs or exposure to fraud or theft resulting from payment card industry related risk and regulations. The forward‑looking statements made in this Form 10‑K relate only to events as of the date on which the statements are made. Except as may be required by law, we disclaim obligations to update any forward‑looking statements to reflect events or circumstances after the date on which the statements were made or to reflect the occurrence of unanticipated events. Investors are cautioned not to place undue reliance on any forward‑looking statements. One of the original off-price retailers, Tuesday Morning is a leading destination for unique home and lifestyle goods. We were established in 1974 and specialize in name-brand, better/best products for the home. We are known for irresistible finds at an incredible value and search the world for amazing deals to bring to our customers. We are a closeout retailer, selling high-quality products at prices generally below those found in boutique, specialty and department stores, catalogs and on-line retailers. Our customers come to us for an ever-changing, exceptional assortment of brand names at great prices. Our primary merchandise categories are upscale home textiles, home furnishings, housewares, gourmet food, toys and seasonal décor. Key vendors are Peacock Alley, Sferra, Lenox, Cuisinart, Home Environment, and Charisma. We buy our inventory opportunistically from a variety of sources including direct from manufacturer, through closeout sellers and occasionally other retailers. We have strong supplier relationships and we strive to make it easy for our vendors to do business with us, so that they will come to us first. Our goods are deeply-discounted, but never seconds or irregulars. Our customer is a savvy shopper with a discerning taste for quality at a value. Our strong value proposition has established a loyal customer base, who we engage regularly with social media, email, direct mail, digital media and newspaper circulars. With over 715 stores across the country, we are in the neighborhood in convenient, accessible locations. Our store layout is clean and simple, and the low-frills environment means we can pass even deeper savings on to our dedicated customer base. Our stores operate in both primary and secondary locations of major suburban markets, near our middle and upper‑income customers. We are generally able to obtain favorable lease terms due to our flexibility regarding site selection and our straightforward format, allowing us to use a wide variety of space configurations. We operate our business as a single operating segment. Several years ago, we began a transformation of our Company in order to regain our position as a leader in off‑price retail. We executed on a number of critical steps under our business turnaround strategy. These steps included exiting certain categories, refreshing and reorganizing stores, reducing the level of clearance merchandise, modifying company policies, and eliminating assets that were no longer needed. During this phase, we took specific steps to improve our inventory management process, sourcing of inventory, merchandise offerings and sales productivity. Since fiscal year 2014, when we moved into our rebuilding phase, we have been focusing on supply chain efficiency, working capital management and inventory turns, repositioning our real estate portfolio, implementing a new marketing strategy, and continuing to improve our merchandise assortment, cost controls and infrastructure. As a key component of this rebuilding phase, we are focused on improving store locations and the in-store experience for our customers. In this regard, we are closing less productive stores with limited foot traffic and relocating some of these stores to, or opening new stores in, better locations with footprints that are on average three to five thousand square feet larger. In some cases, we are also expanding existing stores to this larger footprint. In addition, we are improving the finishes in these relocated, new and expanded stores, such as polished concrete floors, simple but attractive fixture packages and new lighting and color palettes, in an effort to match the in-store experience for our customers with the quality of our products. We believe the principal factors by which we compete are brand names, price, breadth and quality of our product offerings. Our prices are generally below those of department and specialty stores, catalog and on‑line retailers and we offer a broad assortment of high‑end, first quality, brand-name merchandise. We currently compete against a diverse group of retailers, including department, discount and specialty stores, e‑commerce and catalog retailers and mass merchants, which sell, among other products, home furnishings, housewares and related products. We also compete in particular markets with a substantial number of retailers that specialize in one or more types of home furnishing and houseware products that we sell. Some of these competitors have substantially greater financial resources that may, among other things, increase their ability to purchase inventory at lower costs or to initiate and sustain aggressive price competition. Our business is subject to seasonality, with a higher level of our net sales and operating income generated during the quarter ending December 31, which includes the holiday shopping season. Net sales in the quarters ended December 31, 2017, 2016, and 2015 accounted for approximately 33%, 34% and 33% of our annual net sales for fiscal years 2018, 2017 and 2016, respectively. Because of the seasonal nature of our business, our working capital needs are greater in the months leading up to our peak sales period from Thanksgiving to the end of December. The increase in working capital needs during this time is typically financed with cash flow provided by operations and our revolving credit facility. Additional details are provided in the Liquidity and Capital Resources section in Item 7, Management’s Discussion and Analysis of Financial Condition and Results of Operations. Inventory is the largest asset on our balance sheet. Efficient inventory management is a key component of our business success and profitability. To be successful, we must maintain sufficient inventory levels to meet our customers’ demands while keeping the inventory fresh and turning the inventory appropriately to optimize profitability. We provide an outlet for manufacturers and other sources looking for effective ways to reduce excess inventory resulting from order cancellations by retailers, manufacturing overruns, bankruptcies and excess capacity. Since our inception, we have not experienced significant difficulty in obtaining first quality, brand-name off‑price merchandise in adequate volumes and at competitive prices. We utilize a mix of both domestic and international suppliers. We pay our suppliers timely and generally do not request special consideration for markdowns, advertising or returns. During fiscal 2018, our top ten vendors accounted for approximately 12% of total purchases, with no single vendor accounting for more than 3% of total purchases. It is our goal to operate with a low cost structure in comparison to many other retailers. We place great emphasis on expense management throughout the Company. Our stores have a “no frills” format and we are flexible in our site selection in order to maintain favorable lease terms. While we offer a “no frills” format in our stores, we have made progress in reorganizing and refreshing our stores to enhance our customers’ shopping experience. We offer a flexible return policy and we accept all major payment methods including cash, checks, all major credit cards, and digital wallets. We continue to work on initiatives we believe will enhance our customers’ shopping experience. We utilize 1.2 million square feet of distribution center facilities in Dallas, Texas and a 0.6 million square foot distribution center in Phoenix, Arizona which service all of our stores throughout the United States. The Phoenix distribution center commenced operations during the fourth quarter of fiscal 2016. We shipped approximately 120 million units to our stores during fiscal 2018. Our pricing policy is to sell merchandise generally below retail prices charged by department and specialty stores, catalog and on‑line retailers. Prices are determined centrally and are initially uniform at all of our stores. Once a price is determined for a particular item, labels displaying two‑tiered pricing are affixed to the product. A typical price tag displays a “Compare At” or “Compare Estimated Value” price, and “Our Price”. Our buyers determine and verify retail “Compare At” or “Compare Estimated Value” prices by reviewing prices published in advertisements, catalogs, on‑line and manufacturers’ suggested retail price lists and by visiting department or specialty stores selling similar merchandise. Our information systems provide daily sales and inventory information, which enables us to evaluate our prices and inventory levels and to adjust prices on unsold merchandise in a timely manner and on a periodic basis as dictated by sales volumes and incoming purchases, thereby effectively managing our inventory levels and offering competitive pricing. As of June 30, 2018, we employed 1,770 persons on a full‑time basis and 7,292 persons on a part‑time basis. Our employees are not represented by any labor unions. We have not experienced any work stoppage due to labor disagreements, and we believe that our employee relations are strong. The trade name “Tuesday Morning” is material to our business. We have registered the name “Tuesday Morning” as a service mark with the United States Patent and Trademark office. We have also registered other trademarks including but not limited to “Tuesday Morning Perks®”. Solely for convenience, trademarks and trade names referred to in this Form 10‑K may appear without the ® or tm symbols, but such references are not intended to indicate, in any way, that we will not assert, to the fullest extent under applicable law, our rights, or the rights of the applicable licensor, to these trademarks and trade names. Tuesday Morning Corporation is a Delaware corporation incorporated in 1991. Our principal executive offices are located at 6250 LBJ Freeway, Dallas, Texas 75240, and our telephone number is (972) 387‑3562. We maintain a website at www.tuesdaymorning.com. Copies of our Annual Reports on Form 10‑K, Quarterly Reports on Form 10‑Q, Current Reports on Form 8‑K and any amendments to such reports filed with, or furnished to, the Securities and Exchange Commission (the “SEC”) are available free of charge on our website under the Investor Relations section as soon as reasonably practicable after we electronically file such reports and amendments with, or furnish them to, the SEC. The reports we file or furnish to the SEC may be read and copied at the SEC’s Public Reference Room at 100 F Street, NE, Washington, D.C. 20549. Information on the operation of the Public Reference Room may be obtained by calling the SEC at 1‑800‑SEC‑0330. In addition, the SEC maintains a website, www.sec.gov, which contains the reports, proxy and information statements and other information which we file with, or furnish to, the SEC. Site Selection. We continually evaluate our current store base for potential enhancement or relocation of our store locations. As a result of this ongoing evaluation, we intend to pursue attractive relocation opportunities in our existing store base, close certain stores by allowing leases to expire for underperforming stores or where alternative locations in similar trade areas are not available at acceptable lease rates, and, when appropriate, open new stores. For both new stores and relocations, we negotiate for upgraded sites. We believe that this strategy will better position us for long‑term profitable growth. We expect to upgrade both the appearance and operation of our new and relocated stores compared to our existing stores and do not anticipate difficulty in locating additional store locations in areas with our target customer demographics. Store Leases. Except for one store adjacent to our existing distribution center in Dallas, Texas, we lease our store locations under operating leases that typically include renewal options. Some of our leases also provide for contingent rent based upon store sales exceeding stipulated amounts. Our store leases typically include “kick clauses,” which allow us, at our option, to exit the lease with no penalty 24 to 60 months after entering into the lease if store sales do not reach a stipulated amount stated in the lease. These kick clauses provide us with flexibility in opening new stores and relocating existing stores by allowing us to quickly and cost‑effectively vacate a site that does not meet our sales expectations. As a result, we generally do not operate locations with continued store‑level operating losses. Store Layout. Our site selection process and “no frills” approach to presenting merchandise allow us to use a wide variety of space configurations. The size of our stores ranges from approximately 5,600 to 30,000 square feet, averaging on a per store basis approximately 12,100 square feet as of June 30, 2018. Historically, we have designed our stores to be functional, with less emphasis placed upon fixtures and leasehold aesthetics. With our current real estate strategy, we continue to be focused on designing a very functional, easy to shop environment that also highlights the quality of the merchandise. We display all merchandise on counters, shelves, or racks while maintaining minimum inventory in our stockrooms. Store Operations. Our stores are generally open seven days a week, excluding certain holidays. We continue to maintain the frequency of shipments of merchandise which results in improved efficiency of receiving and restocking activities at our stores. We attempt to align our part‑time employees’ labor hours with anticipated workload and with current customer sales. We conduct annual physical counts of our store merchandise staggered throughout the second half of our fiscal year, primarily when stores are closed. Store Management. Each store has a manager who is responsible for recruiting, training and supervising store personnel and assuring that the store is managed in accordance with our established guidelines and procedures. Store managers are full‑time employees. Our store managers are supported by district and regional level support. Store managers are responsible for centrally-directed store disciplines and routines. The store manager is assisted primarily by part‑time employees who generally serve as assistant managers and cashiers, and help with merchandise stocking efforts. Members of our management visit selected stores routinely to review inventory levels and merchandise presentation, personnel performance, expense controls, security and adherence to our policies and procedures. In addition, district and regional field managers periodically meet with senior management to review store policies and discuss purchasing, merchandising, advertising and other operational issues. Our business is subject to significant risks, including the risks and uncertainties described below. These risks and uncertainties and the other information in this Form 10‑K, including our consolidated financial statements and the notes to those statements, should be carefully considered. If any of the events described below actually occur, our business, financial condition or results of operations could be adversely affected in a material way. We may not be successful in the implementation of our long‑term business strategy, which could adversely affect our business and our results of operations. our employees’ ability to adapt to our new strategic initiatives. Changes in economic and political conditions may adversely affect consumer spending, which could significantly harm our business, results of operations, cash flows and financial condition. consumer confidence in future economic conditions. The merchandise we sell generally consists of discretionary items. Reduced consumer confidence and spending cut backs may result in reduced demand for our merchandise, including discretionary items, and may force us to take significant inventory markdowns. Reduced demand also may require increased selling and promotional expenses. Adverse economic conditions and any related decrease in consumer demand for our merchandise could have a material adverse effect on our business, results of operations, cash flows and financial condition. Any failure to identify and respond to changes in consumer trends and preferences could significantly harm our business. The retail home furnishings and housewares industry is subject to sudden shifts in consumer trends and consumer spending. Our sales and results of operations depend in part on our ability to predict or respond to changes in trends and consumer preferences in a timely manner. Although our business model allows us greater flexibility than many traditional retailers to meet consumer preferences and trends, we may not successfully do so. Any sustained failure to anticipate, identify and respond to emerging trends in consumer preferences could negatively affect our business and results of operations. We must continuously attract buying opportunities for off‑price merchandise and anticipate consumer demand as off‑price merchandise becomes available, and our failure to do so could adversely affect our performance. By their nature, specific off‑price merchandise items are available from manufacturers or vendors generally on a non‑recurring basis. As a result, we do not have long‑term contracts with our vendors for supply, pricing or access to products, but make individual purchase decisions, which may be for large quantities. Due to economic uncertainties, some of our manufacturers and suppliers may cease operations or may otherwise become unable to continue supplying off‑price merchandise on terms acceptable to us. We cannot assure that manufacturers or vendors will continue to make off‑price merchandise available to us in quantities acceptable to us or that our buyers will continue to identify and take advantage of appropriate buying opportunities. In addition, if we misjudge consumer demand for products, we may significantly overstock unpopular products and be forced to take significant markdowns and miss opportunities to sell more popular products. An inability to acquire suitable off‑price merchandise in the future or to accurately anticipate consumer demand for such merchandise would have an adverse effect on our business, results of operations, cash flows and financial condition. Our results of operations will be negatively affected if we are not successful in managing our inventory profitably. customer trends or purchasing actions, we may have to take unanticipated markdowns to dispose of the excess inventory, which also can adversely impact our financial results. We continue to focus on ways to reduce these risks, but we cannot assure that we will be successful in our inventory management. If we are not successful in managing our inventory balances, our results of operations may be negatively affected. We have recorded significant inventory write‑downs from time to time in the past and there can be no assurances that we will not record additional inventory charges in the future. Our results of operations will be negatively affected if we are unsuccessful in effectively managing our supply chain operations. With few exceptions, all inventory is shipped directly from suppliers either to our distribution center in the Dallas, Texas metropolitan area, or our Phoenix distribution center, where the inventory is then processed, sorted and shipped to our stores. We depend in large part on the orderly operation of this receiving and distribution process, which depends, in turn, on adherence to shipping schedules and effective management of our distribution centers. We may not anticipate all of the changing demands which our expanding operations will impose on our receiving and distribution system. The loss of, disruption in operations, or increased costs in the operation of our distribution center facilities would have a material adverse effect on our business and operations. Events beyond our control, such as disruptions in operations due to fire or other catastrophic events, labor disagreements or shipping problems, may result in delays in the delivery of merchandise to our stores. We also cannot assure that our insurance will be sufficient, or that insurance proceeds will be paid to us in a timely manner, in the event a distribution center is shut down for any reason. The unplanned loss or departure of one or more members of our senior management or other key management could have a material adverse effect on our business. Our future performance will depend in large part upon the efforts and abilities of our senior management and other key employees. The loss of service of these persons could have a material adverse effect on our business and future prospects. We do not maintain key person life insurance for our senior management. We cannot provide any assurance that we will not experience future turnover related to our senior management team. Our business is intensely competitive, and a number of different competitive factors could have a material adverse effect on our business, results of operations, cash flows and financial condition. The retail home furnishings and housewares industry is intensely competitive. As an off‑price retailer of home furnishings and housewares, we currently compete against a diverse group of retailers, including department stores and discount stores, specialty, on‑line, and catalog retailers and mass merchants, which sell, among other products, home furnishing, houseware and related products similar and often identical to those we sell. We also compete in particular markets with a substantial number of retailers that specialize in one or more types of home furnishing and houseware products that we sell. Many of these competitors have substantially greater financial resources that may, among other things, increase their ability to purchase inventory at lower costs or to initiate and sustain aggressive price competition. adoption by existing competitors of innovative store formats or retail sales methods. international retailers. We also face competition from alternative retail distribution channels such as catalogs and, increasingly, e‑commerce websites and mobile device applications. Changes in the merchandising, pricing and promotional activities of those competitors, and in the retail industry, in general, may adversely affect our performance. If we are unable to successfully execute our strategy of relocating and expanding existing stores and when appropriate, opening new stores, our operating performance could be adversely impacted. As part of our business strategy, we intend to pursue relocation opportunities to improve our existing store base as well as open new stores that will offset the closing of lower performing stores as they come up for renewal. However, we cannot assure that we will be able to achieve our relocation goals or that we will be able to operate any new or relocated stores profitably. Further, we cannot assure that any new or relocated store will achieve similar operating results to those of our existing stores or that new, relocated or expanded stores opened in markets in which we operate will not have a material adverse effect on the net sales and profitability of our existing store base. our ability to successfully negotiate the termination of leases without significant negative financial impact. While we opened stores in existing markets during fiscal 2018, 2017, and 2016, we also opened stores in new markets during that time period. These markets may have different competitive conditions, consumer trends and discretionary spending patterns than our existing markets, which may cause our new stores in these markets to be less successful than stores in our existing markets. Increases in fuel prices and changes in transportation industry regulations or conditions may increase our freight costs and thus our cost of sales, which could have a material adverse effect on our business and operations. Our freight costs are impacted by changes in fuel prices through surcharges. Fuel prices and surcharges affect freight costs both on inbound freight from vendors to our distribution centers and outbound freight from our distribution centers to our stores. In addition, the U.S. government requires drivers of over‑the‑road trucks to take certain rest periods which reduces the available amount of time they can drive during a 24‑hour period. Changes in trucking industry conditions, such as truck driver shortages and highway congestion, could increase freight costs. High fuel prices or surcharges, as well as stringent driver regulations and changes in transportation industry conditions, may increase freight costs and thereby increase our cost of sales. If we are not able to generate strong cash flows from our operations or to continue to access credit markets, we will not be able to support capital expansion, operations or debt repayment. activities or the lack of availability of financing in adequate amounts and on appropriate terms could adversely affect our financial performance. An increase in the cost or a disruption in the flow of our imported products may significantly decrease our sales and profits. Merchandise manufactured and imported from overseas represents the majority of our total product purchases acquired both domestically and internationally. A disruption in the shipping of imported merchandise or an increase in the cost of those products may significantly decrease our sales and profits. In addition, if imported merchandise becomes more expensive or unavailable, the transition to alternative sources may not occur in time to meet our demands. Products from alternative sources may also be of lesser quality and more expensive than those we currently import. The products we buy abroad are sometimes priced in foreign currencies and, therefore, we are affected by fluctuating exchange rates. We might not be able to successfully protect ourselves in the future against currency rate fluctuations, and our financial performance could suffer as a result. Changes to federal tax policy may adversely impact our operations and financial performance. The U.S. federal government continues to analyze comprehensive tax reform options that could negatively impact companies that directly or indirectly import goods and on July 10, 2018, the Office of the U.S. Trade Representative proposed a 10% tariff on additional classes of products imported to the U.S. from China. The Company sources a portion of its products from multiple countries, including China. The Company is evaluating strategies to mitigate the impact of the proposed tariff, including reviewing sourcing options as well as collaborative efforts with its vendor partners. Major developments in tax policy or trade relations, such as the disallowance of tax deductions for imported merchandise or the imposition of unilateral tariffs on imported products, could have a material adverse effect on our business, results of operations, financial condition, and liquidity. Our success depends upon our marketing, advertising and promotional efforts. If we are unable to implement them successfully, or if our competitors are more effective than we are, our results of operations may be adversely affected. of promotional intensity or merchandising strategy by our competitors could cause us to have some difficulties in retaining existing customers and attracting new customers. If we do not attract, train and retain quality employees in appropriate numbers, including key employees and management, our performance could be adversely affected. Our performance is dependent on recruiting, developing, training and retaining quality sales, distribution center and other employees in large numbers, as well as, experienced buying and management personnel. Many of our employees are in entry level or part‑time positions with historically high rates of turnover. Our ability to meet our labor needs while controlling costs is subject to external factors, such as unemployment levels, prevailing wage rates, minimum wage legislation, and changes in rules governing eligibility for overtime and changing demographics. In the event of increasing wage rates, if we do not increase our wages competitively, our staffing levels and customer service could suffer because of a declining quality of our workforce, or our earnings would decrease if we increase our wage rates, whether in response to market demands or new minimum wage legislation. Changes that adversely impact our ability to attract and retain quality employees and management personnel could adversely affect our performance. Our results of operations are subject to seasonal and quarterly fluctuations, which could have a material adverse effect on our operating results or the market price of our common stock. Because a significant percentage of our net sales and operating income are generated in the quarter ending December 31, we have limited ability to compensate for shortfalls in December quarter sales or earnings by changes in our operations or strategies in other quarters. A significant shortfall in results for the quarter ending December 31 of any year could have a material adverse effect on our annual results of operations and on the market price of our common stock. In addition, in anticipation of higher sales during this period, we purchase substantial amounts of seasonal inventory and hire many temporary employees. An excess of seasonal merchandise inventory could result if our net sales during this principal selling season were to fall below either seasonal norms or expectations. If our December quarter sales results are substantially below expectations, our financial performance and operating results could be adversely affected by unanticipated markdowns, particularly in seasonal merchandise. Lower than anticipated sales in the principal selling season would also negatively affect our ability to absorb the increased seasonal labor costs. actions of competitors, including promotional activity. These factors could also have a material adverse effect on our annual results of operations and on the market price of our common stock. If we are unable to maintain and protect our information technology systems and technologies, we could suffer disruptions in our business, damage to our reputation, increased costs and liability, and obstacles to our growth. systems could result in data loss, a failure to meet our reporting obligations, or material misstatements in our consolidated financial statements, or cause losses due to disruption of our business operations and loss of customer confidence. These adverse situations could also lead to loss of sales or profits or cause us to incur additional repair, replacement and development costs. Our inability to improve our information technology systems and technologies may fail to support our growth and may limit opportunities. If we fail to protect the security of information about our business and our customers, suppliers, business partners and employees, we could damage our reputation and our business, incur substantial additional costs and become subject to litigation and government investigations and enforcement actions. In the ordinary course of our business, we collect and store sensitive data, including intellectual property, our proprietary business information and that of our customers, suppliers and business partners, and personally identifiable information of our customers and employees, on our computer networks and information systems. The secure processing, maintenance and transmission of this information is critical to our operations. Despite our security measures, our information technology and infrastructure and that of our service providers may be vulnerable to attacks by hackers or breached due to employee error, malfeasance or other disruptions. Cyber threats are rapidly evolving and are becoming increasingly sophisticated. Any such attack or breach could compromise our security and remain undetected for a period of time, and confidential information could be misappropriated, resulting in a loss of customers’, suppliers’, business partners’ or employees’ personal information, negative publicity, harm to our business and reputation, and potentially causing us to incur costs to reimburse third parties for damages and potentially subjecting us to government investigations and enforcement actions. In addition, the regulatory environment surrounding data and information security and privacy is increasingly demanding, as new and revised requirements are frequently imposed across our business. Compliance with more demanding privacy and information security laws and standards may result in significant expense due to increased investment in technology and the development of new operational processes, and implementing new initiatives could result in system disruptions. We maintain cyber risk insurance, but this insurance may not be sufficient to cover all of our losses from any future breaches of our systems. We are subject to various government regulations, changes in the existing laws and regulations and new laws and regulations which may adversely affect our operations and financial performance. The development and operation of our stores are subject to various federal, state and local laws and regulations in many areas of our business, including, but not limited to, those that impose restrictions, levy a fee or tax, or require a permit or license, or other regulatory approval, and building and zoning requirements. Difficulties or failures in obtaining required permits, licenses or other regulatory approvals could delay or prevent the opening of a new store, and the suspension of, or inability to renew, a license or permit could interrupt operations at an existing store. We are also subject to laws governing our relationship with employees, including minimum wage requirements, overtime, health insurance mandates, working and safety conditions, and immigration status requirements. Additionally, changes in federal labor laws could result in portions of our workforce being subjected to greater organized labor influence. This could result in an increase to our labor costs. A significant portion of our store personnel are paid at rates related to the minimum wage established by federal, state and municipal law. Additionally, we are subject to certain laws and regulations that govern our handling of customers’ personal information. A failure to protect the integrity and security of our customers’ personal information could expose us to private litigation and government investigations and enforcement actions, as well as materially damage our reputation with our customers. While we endeavor to comply with all applicable laws and regulations, governmental and regulatory bodies may change such laws and regulations in the future which may require us to incur substantial cost increases. If we fail to comply with applicable laws and regulations, we may be subject to various sanctions, penalties or fines and may be required to cease operations until we achieve compliance which could have a material adverse effect on our consolidated financial results and operations. We face litigation risks from customers, employees, and other third parties in the ordinary course of business. Our business is subject to the risk of litigation by customers, current and former employees, suppliers, stockholders and others through private actions, class actions, administrative proceedings, regulatory actions, or other litigation. The outcome of litigation, particularly class action lawsuits and regulatory actions, is difficult to assess or quantify. Plaintiffs in these types of lawsuits may seek recovery of very large or indeterminate amounts, and the magnitude of the potential loss relating to such lawsuits may remain unknown for substantial periods of time. The cost to defend future litigation may be significant. There may also be adverse publicity associated with litigation that could decrease customer acceptance of merchandise offerings, regardless of whether the allegations are valid or whether we are ultimately found liable. We face risks with respect to product liability claims and product recalls, which could adversely affect our reputation, our business, and our consolidated results of operations. We purchase merchandise from third parties and offer this merchandise to customers for sale. In addition, we currently expect to develop and manufacture certain merchandise for sale, initially on a very limited basis. Merchandise could be subject to recalls and other actions by regulatory authorities. Changes in laws and regulations could also impact the type of merchandise we offer to customers. We have experienced, and may in the future experience, issues that result in recalls of merchandise. In addition, in the past, individuals have asserted claims, and may in the future assert claims, that they have sustained injuries from third‑party merchandise offered by us, and we may be subject to future lawsuits relating to these claims. There is a risk that these claims or liabilities may exceed, or fall outside the scope of, our insurance coverage. Any of the issues mentioned above could result in damage to our reputation, diversion of development and management resources, or reduced sales and increased costs, any of which could harm our business. Our stores may be adversely affected by local conditions, natural disasters, and other events. Certain regions in which our stores are located may be subject to adverse local conditions, natural disasters, and other events. If severe weather, such as heavy snowfall or extreme temperatures, discourages or restricts customers in a particular region from traveling to our stores, our sales could be adversely affected. If severe weather conditions occur during the second quarter of our fiscal year, the adverse impact to our sales and profitability could be even greater than at other times during the year because we generate a significant portion of our sales and profits during this period. Natural disasters including tornados, hurricanes, floods, and earthquakes may damage our stores, corporate office, and distribution facilities or other operations, which may adversely affect our financial results. Additionally, demographic shifts in the areas where our stores are located could adversely impact our financial results and operations. Our results of operations may be negatively affected by inventory shrinkage. We are subject to the risk of inventory loss and theft. Although our inventory shrinkage rates have not fluctuated significantly in recent years, we cannot assure that actual rates of inventory loss and theft in the future will be within our estimates or that the measures we are taking will effectively reduce the problem of inventory shrinkage. Although some level of inventory shrinkage is an unavoidable cost of doing business, if we were to experience higher rates of inventory shrinkage or incur increased security costs to combat inventory theft, our results of operations could be affected adversely. Our results of operations may be negatively impacted by exposure to unexpected costs related to our insurance programs. Our insurance coverage is subject to deductibles, self-insured retentions, limits of liability and similar provisions that we believe are prudent based on our overall operations. We may incur certain types of losses that we cannot insure or which we believe are not economically reasonable to insure, such as losses due to acts of war and terrorism, employee and certain other crime, and some natural disasters. If we incur these losses and they are material, our business could suffer. Certain material events may result in sizable losses for the insurance industry and adversely impact the availability of adequate insurance coverage or result in excessive premium increases. To offset negative cost trends in the insurance market, we may elect to self-insure, accept higher deductibles or reduce the amount of coverage in response to these market changes. In addition, we self-insure a significant portion of expected losses under our workers’ compensation, general liability, including automobile, and group health insurance programs. Unanticipated changes in any applicable actuarial assumptions and management estimates underlying our recorded liabilities for these self-insured losses, including potential increases in medical and indemnity costs, could result in significantly different expenses than expected under these programs, which could have a material adverse effect on our financial condition and results of operations. Although we continue to maintain property insurance for catastrophic events, we are self-insured for losses up to the amount of our deductibles. If we experience a greater number of self-insured losses than we anticipate, our financial performance could be adversely affected. Our sales depend on a volume of traffic to our stores, and a reduction in traffic to, or the closing of, anchor tenants and other destination retailers in the shopping centers in which our stores are located could significantly reduce our sales and leave us with excess inventory. Most of our stores are located in shopping centers that benefit from varied and complementary tenants, whether specialty or mass retailers, and other destination retailers and attractions to generate sufficient levels of consumer traffic near our stores. Any decline in the volume of consumer traffic at shopping centers, whether because of consumer preferences to shop on the internet or at large warehouse stores, an economic slowdown, a decline in the popularity of shopping centers, the closing of anchor stores or other destination retailers or otherwise, could result in reduced sales at our stores and leave us with excess inventory, which could have a material adverse effect on our financial results or business. We are subject to customer payment-related risks that could increase operating costs or exposure to fraud or theft, subject us to potential liability and potentially disrupt our business. We accept payments using a variety of methods, including cash, credit and debit cards, gift cards, gift certificates and store credits. Acceptance of these payment options subjects us to rules, regulations, contractual obligations and compliance requirements, including payment network rules and operating guidelines, data security standards and certification requirements, and rules governing electronic funds transfers. In October 2015, the payment card industry shifted liability for certain debit and credit card transactions to retailers who are not able to accept EMV chip technology transactions. Any inability to accept EMV chip technology transactions may subject us to increased risk of liability for fraudulent transactions and may adversely affect our business and operating results. For certain payment methods, including credit and debit cards, we pay interchange and other fees, which may increase over time and raise our operating costs. We rely on third parties to provide payment processing services, including the processing of credit cards, debit cards, and other forms of electronic payment. If these companies become unable to provide these services to us, or if their systems are compromised, it could potentially disrupt our business. The payment methods that we offer also subject us to potential fraud and theft by criminals, who are becoming increasingly more sophisticated, seeking to obtain unauthorized access to or exploit weaknesses that may exist in the payment systems. If we fail to comply with applicable rules or requirements for the payment methods we accept, or if payment-related data is compromised due to a breach or misuse of data, we may be liable for costs incurred by payment card issuing banks and other third parties or subject to fines and higher transaction fees, or our ability to accept or facilitate certain types of payments may be impaired. In addition, our customers could lose confidence in certain payment types, which may result in a shift to other payment types or potential changes to our payment systems that may result in higher costs. As a result, our business and operating results could be adversely affected. Our certificate of incorporation, and bylaws and Delaware law contain provisions that could make it more difficult for a third party to acquire us without the consent of our Board of Directors. the requirement for advance notice for nominations for directors to our Board of Directors and for proposing matters that can be acted upon by stockholders at stockholder meetings. Because we do not presently have any plans to pay dividends on our common stock, stockholders must look solely to appreciation of our common stock to realize a gain on their investment. We have not paid a regular cash dividend since 2008 and do not presently have any plans to pay dividends for the foreseeable future. Accordingly, stockholders must look solely to appreciation of our common stock to realize a gain on their investment. This appreciation may not occur. The price of our common stock has fluctuated substantially over the past several years and may continue to fluctuate substantially in the future. From July 1, 2017 to June 30, 2018, the trading prices of our common stock ranged from a low of $1.65 per share to a high of $4.10 per share. We expect our stock to continue to be subject to fluctuations as a result of a variety of factors, including factors beyond our control, which have been included throughout this Annual Report on Form 10‑K. We may fail to meet the expectations of our stockholders or securities analysts at some time in the future, and our stock price could decline as well. We lease all of our stores from unaffiliated third parties, except one Company‑owned store located adjacent to our existing distribution facility in Dallas, Texas. A description of the location of our stores is provided in Item 1, “Business—Stores and Store Operations.” At June 30, 2018, the remaining terms of the majority of our store leases range from one month to five years. The average initial term of store leases executed under our new real estate strategy is approximately ten years, typically with options available for renewal. We intend to continue to lease all of our new stores from unaffiliated third parties. Our store leases typically include “kick clauses,” which allow us, at our option, to exit the lease with no penalty 24 to 60 months after entering into the lease if store sales do not reach a stipulated amount stated in the lease. Distribution Facilities and Corporate Headquarters. We own a 104,675 square foot building which houses our corporate office in Dallas, Texas. Our Dallas distribution center utilizes approximately 1.2 million square feet, all of which is owned. During fiscal 2015, we executed a lease for approximately 0.6 million square feet related to our additional distribution center in Phoenix, Arizona which started operations in the fourth quarter of fiscal 2016. We lease from unaffiliated third parties two parcels of land of approximately 301,550 square feet, for trailer storage and parking. We are continuing to evaluate our distribution network needs to accommodate our distribution requirements for our existing store base as well as for future growth. We are involved in legal and governmental proceedings as part of the normal course of our business. Reserves have been established when a loss is considered probable and are based on management’s best estimates of our potential liability in these matters. These estimates have been developed in consultation with internal and external counsel and are based on a combination of litigation and settlement strategies. Management believes that such litigation and claims will be resolved without material effect on our financial position or results of operations. The Company was a defendant in a purported class action lawsuit, Jerry Castillo v. Tuesday Morning Inc., which was filed on December 28, 2017 in the United States District Court, Middle District of Florida. The case was brought under the Fair Labor Standards Act and included allegations that the Company violated various wage and hour labor laws. Relief was sought on behalf of current and former Company employees. The lawsuit sought to recover damages, penalties and attorneys’ fees as a result of the alleged violations. The matter settled for an amount not material to the Company on July 6, 2018 and the Court approved the settlement on July 9, 2018. The Company was also a defendant in a purported class action lawsuit, Hector Velarde, on behalf of himself and all other similar situated, Pltf. vs. Tuesday Morning, Inc., which was filed on February 26, 2018 in state court and was pending in the United States District Court, Central District of California. The case was brought under the Unruh Civil Rights Act, California Code § 51 ci seq. (“Unruh Act”), the California Disabled persons Act, California Civil Code § 54 et seq. (“CDPA”), and Cal. Civ. Code § 55 et seq. and included allegations that the Company violated various public access laws. The lawsuit sought to recover damages, penalties and attorneys' fees as a result of the alleged violations. The matter settled for an amount not material to the Company on July 2, 2018 and the Court approved the settlement on July 11, 2018. As of August 17, 2018, there were approximately 209 holders of record of our common stock. On August 22, 2011, our Board of Directors adopted a share repurchase program pursuant to which we are authorized to repurchase from time to time shares of Common Stock, up to a maximum of $5.0 million in aggregate purchase price for all such shares (the “Repurchase Program”). On January 20, 2012, our Board of Directors increased the authorization for stock repurchases under the Repurchase Program from $5.0 million to a maximum of $10.0 million. The Repurchase Program does not have an expiration date and may be amended, suspended or discontinued at any time. The Board will periodically evaluate the Repurchase Program and there can be no assurances as to the number of shares of Common Stock we will repurchase. During the twelve month period ended June 30, 2018, no shares were repurchased under the Repurchase Program. As of June 30, 2018, 1.8 million shares have been repurchased under the Repurchase Program for a total cost (excluding commissions) of approximately $6.8 million. The following graph illustrates a comparison of the cumulative total stockholder return (change in stock price plus reinvested dividends) for the fiscal years ended June 30, 2018, 2017, 2016, 2015 and 2014, of (1) our common stock, (2) the S&P 500 Index, and (3) the S&P 500 retailing index, a pre‑established industry index. The chart assumes that $100 was invested on June 30, 2013, in our common stock and each of the comparison indices, and assumes that all dividends were reinvested. 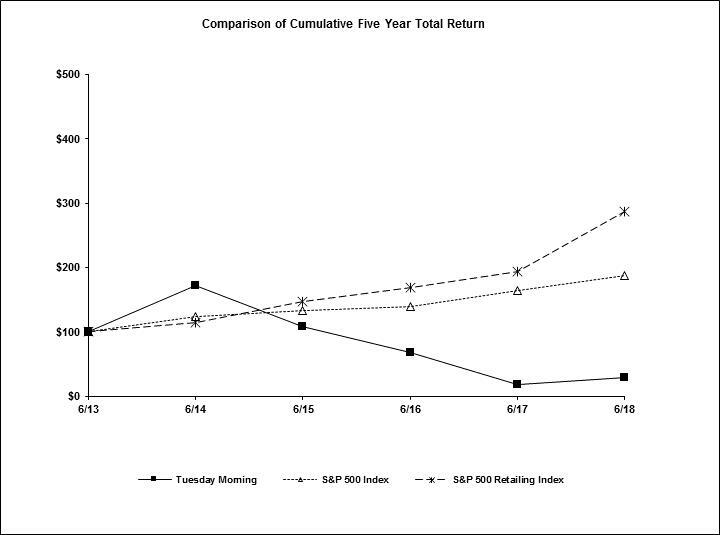 $100 invested on 6/30/13 in stock or index, including reinvestment of dividends. Fiscal year ending June 30. Copyright© 2014 S&P, a division of The McGraw‑Hill Companies Inc. All rights reserved. These indices are included for comparative purposes only and are not intended to forecast or be indicative of possible future performance of our common stock. Act of 1933 or the Securities Exchange Act of 1934, except to the extent we specifically incorporate such information by reference into such a filing. The following table sets forth the selected consolidated financial and operating data for the fiscal years ended June 30, 2018, 2017, 2016, 2015, and 2014. The selected consolidated financial and operating data should be read in conjunction with “Management’s Discussion and Analysis of Financial Condition and Results of Operations” and our consolidated financial statements and related notes thereto included elsewhere in this Form 10‑K. New stores are included in the same store sales calculation starting with the sixteenth month following the date of the store opening. A store that relocates within the same geographic market or modifies its available retail space is generally considered the same store for purposes of this computation. The number of days our stores are open may fluctuate from period to period. Average sales per store is the sum of the average sales per store for each quarter. Inventory turnover is the ratio of cost of sales to average inventory. Average inventory is calculated by taking the average of the previous year‑end and quarter‑end inventory levels throughout the year. Inventory turnover for fiscal 2014 is unadjusted for the inventory charges recorded during that fiscal year as part of our business turnaround strategy. The following discussion and analysis should be read in conjunction with “Selected Financial Data” and our consolidated financial statements and related notes thereto included elsewhere in this Form 10‑K. We are one of the original off-price retailers and a leading destination for unique home and lifestyle goods. We are a closeout retailer, selling high-quality products at prices generally below those found in boutique, specialty and department stores, catalogs and on-line retailers. Our customers come to us for an ever-changing, exceptional assortment of brand names at great prices. Our strong value proposition has established a loyal customer base, who we engage regularly with social media, email, direct mail, digital media and newspaper circulars. During fiscal 2018, we continued to implement our strategy of improving store locations and the in-store experience for our customers, which included (i) closing less productive stores with limited foot traffic and relocating some of these stores to, or opening new stores in, better locations with footprints that are on average three to five thousand square feet larger, (ii) expanding some existing stores to a larger footprint, and (iii) improving the finishes in these relocated, new and expanded stores. We operated 726 stores in 40 states as of June 30, 2018. As part of the implementation of our real estate strategy, our store base decreased by 5 stores in fiscal 2018, decreased by 20 stores in fiscal 2017, and decreased by 18 stores in fiscal 2016. We relocated 45 stores in fiscal 2018, 52 stores in fiscal 2017, and 46 stores in fiscal 2016. For fiscal 2018, net sales were $1.0 billion, an increase of 4.1% compared to fiscal 2017 net sales of $966.7 million, primarily due to an increase in sales from comparable stores (stores open at least five quarters, including stores relocated in the same market and renovated stores) of 3.9%. The increase in comparable store sales was comprised of an increase in customer transactions of 2.9% along with a 1.0% increase in average ticket. Sales at the 45 stores relocated during the past 12 months increased approximately 58% on average for fiscal 2018 as compared to last year and contributed approximately 370 basis points of comparable store sales growth. Net sales during fiscal 2017 were negatively impacted by lower than plan store level inventories for a portion of the year due to the supply chain challenges we experienced during the year along with 20 fewer stores. Cost of sales, as a percentage of net sales, for fiscal 2018 was 66.1%, compared to 66.8% for fiscal 2017. Selling, general and administrative expenses (SG&A) increased $8.9 million to $361.9 million, from $353.0 million for fiscal 2017. Our operating loss for fiscal 2018 was $21.0 million compared to an operating loss of $32.3 million for fiscal 2017. Our net loss for fiscal 2018 was $21.9 million, or diluted net loss per share of $0.50, compared to a net loss for fiscal 2017 of $32.5 million, or diluted net loss per share of $0.74. Our fiscal 2017 results were adversely impacted by increased supply chain and freight costs, driven significantly by elevated costs resulting from our supply chain issues experienced earlier in the year. As shown under the heading “Non-GAAP Financial Measures” below, EBITDA was $5.6 million for fiscal 2018, compared to negative $9.6 million for fiscal 2017. Adjusted EBITDA, was $9.6 million for fiscal 2018 compared to negative $2.8 million for fiscal 2017. Inventory levels at June 30, 2018 increased $12.5 million to $234.4 million from $221.9 million at June 30, 2017. Inventory turnover for the trailing five quarters as of June 30, 2018 was 2.8 turns, an increase from the trailing five quarter turnover as of June 30, 2017 of 2.5 turns. Cash and cash equivalents at June 30, 2018 increased $3.2 million to $9.5 million from $6.3 million at June 30, 2017. We had borrowings of $38.5 million under our revolving credit facility as of June 30, 2018, and borrowings of $30.5 million at June 30, 2017. The following table sets forth, for the periods indicated, selected statement of operations data, expressed as a percentage of net sales, as well as the number of stores open at the end of each period. There can be no assurance that the trends in sales or operating results will continue in the future. Selling, general and administrative expenses are comprised of wages and benefits, rent and occupancy costs, depreciation, advertising, store operating expenses and corporate office costs. While selling, general and administrative expense increases and decreases are generally attributable to changes in variable expenses, higher rents, depreciation, and real estate project costs have increased as we continue to implement our store real estate strategy. Variable expenses include payroll and related benefits, advertising expense and other expenses such as credit card fees. We define EBITDA as net income or net loss before interest, income taxes, depreciation, and amortization. Adjusted EBITDA reflects further adjustments to EBITDA to eliminate the impact of certain items, including certain non-cash items and other items that we believe are not representative of our core operating performance. These measures are not presentations made in accordance with GAAP. EBITDA and Adjusted EBITDA should not be considered as alternatives to net income or loss as a measure of operating performance. In addition, EBITDA and Adjusted EBITDA are not presented as, and should not be considered as alternatives to cash flows as a measure of liquidity. EBITDA and Adjusted EBITDA should not be considered in isolation, or as substitutes for analysis of our results as reported under GAAP and Adjusted EBITDA should not be construed as an inference that our future results will be unaffected by such adjustments. We believe it is useful for investors to see these EBITDA and Adjusted EBITDA measures that management uses to evaluate our operating performance. These non-GAAP financial measures are included to supplement our financial information presented in accordance with GAAP and because we use these measures to monitor and evaluate the performance of our business as a supplement to GAAP measures and we believe the presentation of these non-GAAP measures enhances investors’ ability to analyze trends in our business and evaluate our performance. EBITDA and Adjusted EBITDA are also frequently used by analysts, investors and other interested parties to evaluate companies in our industry. The non-GAAP measures presented may not be comparable to similarly titled measures used by other companies. (1) Adjustment includes charges related to share-based compensation programs, which vary from period to period depending on volume, timing and vesting of awards. We adjust for these charges to facilitate comparisons from period to period. (2) Adjustment includes accelerated rent expense recognized in relation to closing stores prior to lease termination. Favorable lease buyout agreements were negotiated and executed in fiscal 2018, resulting in the reversal of $0.7 million previously recorded accelerated cease-use rent expense. While accelerated rent expense may occur in future periods, the amount and timing of such expenses will vary from period to period. (3) Adjustment includes only certain expenses related to the Phoenix distribution center preparation, ramp up and post go-live activities, including incremental detention costs and certain consulting costs. (4) Adjustment includes only certain incremental expenses which relate to the stockholder nominations as described in our Preliminary and Definitive Proxy Statements filed with the SEC on September 25, 2017 and October 5, 2017, respectively. (5) Adjustment includes the gain recognized from the sale-leaseback transaction which occurred in the fourth quarter of fiscal 2016. Net sales increased $39.6 million, or 4.1%, to $1.0 billion in fiscal 2018 from $966.7 million in fiscal 2017, primarily due to a $35.8 million increase in sales from comparable stores of 3.9%. New stores are included in the same store sales calculation starting with the sixteenth month following the date of the store opening. A store that relocates within the same geographic market or modifies its available retail space is generally considered the same store for purposes of this computation. The increase in comparable store sales was comprised of an increase in customer transactions of 2.9% along with an increase in average ticket of 1.0%. Sales at the 45 stores relocated during the past 12 months increased approximately 58% on average for fiscal 2018 as compared to last year and contributed approximately 370 basis points of comparable store sales growth. Non-comparable store sales include the net effect of sales from new stores and sales from stores that have closed. The non-comparable store sales increase of $3.8 million was driven by 15 store openings, partially offset by 20 store closings, which have occurred since the end of fiscal 2017. Net sales during fiscal 2017 were negatively impacted by lower than plan store level inventories for a portion of the year due to the supply chain challenges we experienced during the year. Gross profit for fiscal 2018 was $341.0 million, an increase of 6.3% compared to $320.7 million for fiscal 2017. As a percentage of net sales, gross margin increased to 33.9% in fiscal 2018 compared with 33.2% in fiscal 2017. The increase in gross margin was primarily due to improvements in initial merchandise mark-up and reduced markdowns, along with reduced distribution and freight costs recognized in the current year from the elevated costs incurred in the prior year as a result of the supply chain issues we experienced in fiscal 2017. In fiscal 2018, we realized cost efficiencies in our distribution operations, partially offset by increased freight costs incurred during the year. year from the prior year, along with reduced promotional spending. Partially offsetting these decreased costs were higher store rent and depreciation, due in part to our strategy to improve store real estate. Our operating loss was $21.0 million during fiscal 2018 as compared to an operating loss of $32.3 million for fiscal 2017, an improvement of 35%. The improvement was primarily due to higher gross profit and SG&A leverage, as discussed above. Net interest expense increased $0.6 million to $2.1 million in fiscal 2018 compared to $1.5 million in the prior year, as a result of increased borrowings on our revolving credit facility during fiscal 2018 along with higher interest rates. Other income decreased $0.5 million to $0.9 million in fiscal 2018 compared to $1.4 million in fiscal 2017. This change was primarily attributable to a $0.4 million lower gain recognized in fiscal 2018 as compared to fiscal 2017 in connection with a sale-leaseback transaction that occurred in fiscal 2016. Income tax benefit for fiscal 2018 was $139,000 compared to income tax expense of $197,000 in fiscal 2017. The effective tax rates for fiscal 2018 and 2017 were 0.6% and (0.6%), respectively. The fiscal 2018 tax benefit includes a favorable tax impact of approximately $0.6 million resulting from the release of a valuation allowance on deferred taxes due to recent tax law changes as discussed in Note 1 to the Consolidated Financial Statements. We currently expect the effect of the recent tax law change to have a nominal impact on our annual effective tax rate, given our cumulative loss position and the related valuation allowance on our deferred tax assets. We currently believe the expected effects on future year effective tax rates to continue to be nominal until the cumulative losses and valuation allowance are fully utilized. A full valuation allowance is currently recorded against substantially all of our net deferred tax assets at June 30, 2018. The total valuation allowance at the end of fiscal years 2018, 2017 and 2016 was $23.7 million, $27.2 million and $16.0 million, respectively. A deviation from the customary relationship between income tax benefit and pretax income results from utilization of the valuation allowance. Net sales increased $10.3 million, or 1.1%, to $966.7 million in fiscal 2017 from $956.4 million in fiscal 2016, primarily due to a $19.7 million increase in sales from comparable stores of 2.2%. New stores are included in the same store sales calculation starting with the sixteenth month following the date of the store opening. A store that relocates within the same geographic market or modifies its available retail space is generally considered the same store for purposes of this computation. Net sales during fiscal 2017 were negatively impacted by lower than plan store level inventories for a portion of the year due to the supply chain challenges we experienced during the year, as well as 20 fewer stores. The increase in comparable store sales was comprised of an increase in customer transactions of 3.4%, offset by a decrease in average ticket of 1.2%. Our comparable store sales increase was partially offset by a decrease in our non-comparable store sales, which decreased a total of $9.5 million, resulting in a 100 basis point negative impact on our increase in net sales. Sales at the 52 stores relocated during the past 12 months increased approximately 52% on average for fiscal 2017 as compared to last year and contributed approximately 290 basis points of comparable store sales growth. Non-comparable store sales include the net effect of sales from new stores and sales from stores that have closed. The non-comparable store sales decrease was driven by 41 store closures, partially offset by 21 store openings, which have occurred since the end of fiscal 2016. Gross profit for fiscal 2017 was $320.7 million, a decrease of 6.2% compared to $341.8 million for fiscal 2016. As a percentage of net sales, gross margin decreased to 33.2% in fiscal 2017 compared with 35.7% in fiscal 2016. The decrease in gross margin was primarily due to elevated costs associated with our supply chain operations, including distribution center and freight costs recognized in the current period. The impact of elevated supply chain and freight costs was a 250 basis point decrease to our gross margin rate in fiscal 2017, as compared to the prior year, driven significantly by our supply chain issues experienced earlier in the year. Additionally, markdowns increased in the current year. Partially offsetting these increases in costs was an improvement in initial merchandise mark-up. SG&A increased 4.0% to $353.0 million in fiscal 2017, compared to $339.4 million in the same period last year. As a percentage of net sales, SG&A was 36.5% for fiscal 2017 compared to 35.5% for the prior year. This increase in SG&A as a percentage of net sales was driven primarily by higher store rent, depreciation, and real estate project expenses, due in part to our strategy to improve store real estate and increased corporate labor and share-based compensation expense in the current period as compared to the prior year period due to executive vacancies in the prior year period. Additionally, we continued to invest in technology and infrastructure which drove incremental costs related to systems in comparison to the prior year period. Partially offsetting these increased costs were reductions in certain other corporate expenses, including legal and professional fees, which decreased as a percentage of net sales from the prior year. In the prior year, we recorded approximately $8.7 million of incremental expenses to support our strategic initiatives. These costs included $3.2 million of accelerated rent expense related to closing stores prior to lease termination, as well as up-front costs for our Phoenix distribution center and duplication of certain costs at our Dallas distribution center and other investments in the business such as an inventory management project, expenses related to advertising research, and investments in store prototype development. Our operating loss was $32.3 million during fiscal 2017 as compared to operating income of $2.4 million for fiscal 2016. The decrease was primarily due to higher SG&A and lower gross profit, as discussed above. Net interest expense increased $0.4 million to $1.5 million in fiscal 2017 compared to $1.1 million in the prior year, as a result of increased borrowings on our revolving credit facility during fiscal 2017. Other income decreased $1.2 million to $1.4 million in fiscal 2017 compared to $2.6 million in fiscal 2016. This change was primarily attributable to a $1.8 million lower gain recognized in fiscal 2017 as compared to fiscal 2016 in connection with a sale-leaseback transaction that occurred in fiscal 2016. Income tax expense for fiscal 2017 was $197,000 compared to $263,000 in fiscal 2016. The effective tax rates for fiscal 2017 and 2016 were (0.6%) and 6.6%, respectively. The change in the effective tax rate was driven in part by our pretax loss in fiscal 2017 compared to pretax income in fiscal 2016. A full valuation allowance was recorded against our deferred tax assets as of June 30, 2017. The total valuation allowance at the end of fiscal years 2017, 2016 and 2015 was $27.2 million, $16.0 million and $16.7 million, respectively. A deviation from the customary relationship between income tax expense/(benefit) and pretax income/(loss) results from utilization of the valuation allowance. In fiscal 2018, cash provided by operating activities was $27.2 million, compared to $0.4 million in the prior fiscal year. The $27.2 million of cash provided by operating activities for fiscal 2018 was due to our net loss of $21.9 million adjusted for non-cash items, including depreciation and amortization of $26.0 million and share based compensation expense of $3.4 million, which were partially offset by a non-cash gain on sale-leaseback of $0.4 million recorded in other income and deferred income taxes of $0.6 million. In fiscal 2018, we received $8.6 million in construction allowances from landlords related to our real estate improvement strategy. Also impacting the cash provided by operating activities were increases in accounts payable of $22.6 million, deferred rent of $1.3 million, other non-current liabilities of $0.4 million, and decreases in prepaid expenses and other current assets of $0.6 million, partially offset by an increase in inventory of $12.5 million and a decrease in accrued liabilities of $0.4 million. The increase in inventory was driven primarily by higher distribution center and in-transit inventory levels, in support of increased sales trends and in preparation for the fall selling season. There were no significant changes to our vendor payment policy during fiscal 2018, 2017, or 2016. In fiscal 2017, cash provided by operating activities was $0.4 million, compared to $8.4 million in the prior fiscal year. The $0.4 million of cash provided by operating activities for fiscal 2017 was due to net loss of $32.5 million adjusted for non-cash items, including depreciation and amortization of $21.7 million and share based compensation expense of $4.2 million, which were partially offset by a non-cash gain on sale-leaseback of $0.7 million recorded in other income. In fiscal 2017, we received $2.6 million in construction allowances from landlords related to our real estate improvement strategy. Also impacting the cash provided by operating activities were a decrease in inventory of $20.3 million as well as an increase in deferred rent of $5.0 million, partially offset by decreases in accounts payable of $16.3 million and accrued liabilities of $2.0 million, increases in prepaid expenses and other current assets of $1.1 million, and a decrease in other non-current liabilities of $0.6 million. The decrease in inventory was driven primarily by lower inventory levels in our distribution centers, and was offset slightly by increased buying, distribution, and freight costs which are capitalized into inventory. Net cash used in investing activities was due to capital expenditures of $30.8 million for the fiscal year ended June 30, 2018. Capital expenditures were primarily associated with store relocations, new store openings, expansions, capital improvements to existing stores and our distribution operations, along with improvements related to our corporate office and equipment. Net cash used in investing activities for the fiscal year ended June 30, 2017 was due to capital expenditures of $41.7 million. The $10.9 million decrease in investment spend in fiscal 2018 as compared to fiscal 2017 was primarily driven by $6.5 million reduced spending on new, relocated and expanded stores, along with decreased spending on our distribution centers and related information technology. Investment spending in fiscal year 2016 was $38.0 million and was related to capital expenditures of $45.5 million and $1.3 million invested in intellectual property, partially offset by $8.8 million of proceeds received from the sale of two buildings and land that comprised a portion of the Dallas distribution center facilities in a sale-leaseback transaction that occurred in fiscal year 2016. The $3.8 million decrease in investment spend in fiscal 2017 as compared to fiscal 2016 was primarily driven by $20.1 million of decreased spending on the Phoenix distribution center and related information technology, partially offset by $14.3 million of increased spending on new, relocated and expanded stores. We currently expect to incur capital expenditures in the range of $15 million to $20 million in fiscal year 2019. The reduced level of capital spend from prior years reflects fewer relocations and new stores, partially offset by higher investments in information technology. Net cash provided by financing activities of $6.8 million in fiscal 2018 relates to $8.0 million of borrowings on our revolving credit facility, net of payments, partially offset by a $1.0 million reduction in our cash overdraft provision and $0.2 million of capital lease principal payments. Net cash provided by financing activities of $33.3 million in fiscal 2017 relates to $30.5 million of borrowings on our revolving credit facility, net of payments, along with a $2.8 million cash overdraft position. Net cash used in financing activities of $1.0 million in fiscal 2016 primarily consisted of $0.9 million of debt issuance costs related to our revolving credit facility, discussed below. On August 18, 2015, we entered into a new credit agreement providing for an asset-based, five-year senior secured revolving credit facility in the amount of up to $180.0 million which matures on August 18, 2020 (the “Revolving Credit Facility”), which replaced our prior revolving credit facility. The availability of funds under the Revolving Credit Facility is limited to the lesser of a calculated borrowing base and the lenders’ aggregate commitments under the Revolving Credit Facility. Our indebtedness under the Revolving Credit Facility is secured by a lien on substantially all of our assets. The Revolving Credit Facility contains certain restrictive covenants, which affect, among others, our ability to incur liens or incur additional indebtedness, change the nature of our business, sell assets or merge or consolidate with any other entity, or make investments or acquisitions unless they meet certain requirements. The Revolving Credit Facility requires that we satisfy a fixed charge coverage ratio at any time that our availability is less than the greater of 10% of our calculated borrowing base or $12.5 million. Our Revolving Credit Facility may, in some instances, limit our ability to pay cash dividends and repurchase our common stock. In order for the borrower under the Revolving Credit Facility, our subsidiary, to make a restricted payment to us for the payment of a dividend or a repurchase of shares, we must, among other things, maintain availability of 20% of the lesser of our calculated borrowing base or our lenders’ aggregate commitments under the Revolving Credit Facility on a pro forma basis for a specified period prior to and immediately following the restricted payment. As of June 30, 2018, we were in compliance with all of the Revolving Credit Facility covenants. At June 30, 2018, we had $38.5 million of borrowings outstanding under the Revolving Credit Facility, $9.5 million of outstanding letters of credit and availability of $60.5 million. Letters of credit under the Revolving Credit Facility are primarily for self-insurance purposes. We incur commitment fees of up to 0.25% on the unused portion of the Revolving Credit Facility, payable quarterly. Any borrowing under the Revolving Credit Facility incurs interest at LIBOR or the prime rate, plus an applicable margin, at our election (except with respect to swing loans, which incur interest solely at the prime rate plus the applicable margin), subject to a floor of the one month LIBOR plus an applicable margin in the case of loans based on the prime rate. Interest expense of $2.1 million for fiscal 2018 was comprised of interest of $1.3 million, commitment fees of $0.4 million, and amortization of financing fees of $0.4 million. At June 30, 2017, we had $30.5 million of borrowings outstanding under the Revolving Credit Facility, $6.0 million of outstanding letters of credit and availability of $64.2 million. We have financed our operations with funds generated from operating activities, available cash and cash equivalents, proceeds from the sale of owned properties and borrowings under our revolving credit facility. Cash and cash equivalents as of June 30, 2018, 2017, and 2016, were $9.5 million, $6.3 million, and $14.1 million, respectively. Our cash flows will continue to be utilized for the operation of our business and the use of any excess cash will be determined by the Board of Directors. Our borrowings have historically peaked during our second fiscal quarter as we build inventory levels prior to the holiday selling season. Given the seasonality of our business, the amount of borrowings under our Revolving Credit Facility may fluctuate materially depending on various factors, including the time of year, our strategic investment needs and the opportunity to acquire merchandise inventory. Our primary uses for cash provided by operating activities relate to funding our ongoing business activities and planned capital expenditures. We may also use available cash to repurchase shares of our common stock. We believe funds generated from our operations, available cash and cash equivalents and borrowings under our Revolving Credit Facility will be sufficient to fund our operations for the next year. If our capital resources are not sufficient to fund our operations, we may seek additional debt or equity financing. However, we can offer no assurances that we will be able to obtain additional debt or equity financing on reasonable terms. Management’s Discussion and Analysis is based upon our consolidated financial statements, which have been prepared in accordance with accounting principles generally accepted in the United States. The preparation of these financial statements requires us to make estimates and judgments that affect the reported amounts of certain assets, liabilities, sales and expenses, and related disclosure of contingent assets and liabilities. On a recurring basis, we evaluate our significant estimates which are based on historical experience and on various other assumptions that we believe are reasonable under the circumstances. Actual results may differ from these estimates. We believe the following critical accounting policies affect our more significant judgments and estimates used in the preparation of our consolidated financial statements. Inventory—Our inventories consist of finished goods and are stated at the lower of cost or market using the retail inventory method for store inventory and the specific identification method for warehouse inventory. We have a perpetual inventory system that tracks on hand inventory and inventory sold at a SKU level. Inventory is relieved and cost of goods sold is recorded based on the current cost of the item sold. Buying, distribution, freight and certain other costs are capitalized as part of inventory and are charged to cost of sales as the related inventory is sold. The retail inventory method, which is used by a number of our competitors, involves management estimates with regard to items such as markdowns. Such estimates may significantly impact the ending inventory valuation at cost as well as the amount of gross margin recognized. Our stores conduct annual physical inventories, staggered during the second half of the fiscal year. During periods in which physical inventory observations do not occur, we utilize an estimate for recording inventory shrink based on the historical results of our previous physical inventories. This estimate may require a favorable or unfavorable adjustment to actual results to the extent that our subsequent actual physical inventory results yield a different result. We have loss prevention and inventory controls programs that we believe minimize shrink. Although inventory shrink rates have not fluctuated significantly in recent years, if the actual rate were to differ from our estimates, then an adjustment to inventory shrink would be required. Inventory is the largest asset on our balance sheet and represented approximately 62%, 62%, and 67% of total assets at June 30, 2018, 2017, and 2016, respectively. Total inventory increased 5.6%, or $12.5 million, from June 30, 2017 to June 30, 2018. Total inventory decreased 8.4%, or $20.4 million, from June 30, 2016 to June 30, 2017. On a per store basis, store inventory increased 1.0% from June 30, 2017 to June 30, 2018 and decreased 0.3% from June 30, 2016 to June 30, 2017. Markdowns—We utilize markdowns to promote the effective and timely sale of merchandise which allows us to consistently provide new merchandise to our customers. We also utilize markdowns coupled with promotional events to drive traffic and stimulate sales. Markdowns may be temporary or permanent. Temporary markdowns are for a designated period of time with markdowns recorded to cost of sales based on quantities sold during the period. Permanent markdowns are charged to cost of sales immediately based on the total quantities on hand at the time of the markdown. Markdowns were 4.8% in fiscal 2018 and were 5.1% in fiscal 2017. Markdowns may vary throughout the quarter or year in timing. The effect of a 1.0% markdown in the value of our inventory at June 30, 2018 would result in a decline in gross profit and a reduction in our earnings per share for the fiscal year ended June 30, 2018 of $2.3 million and $0.05, respectively. Insurance and Self‑Insurance Reserves—We use a combination of insurance and self‑insurance plans to provide for the potential liabilities associated with workers’ compensation, general liability, property insurance, director and officers’ liability insurance, vehicle liability and employee health care benefits. Our stop loss limits per claim are $500,000 for workers’ compensation, $250,000 for general liability, and $150,000 for medical. Liabilities associated with the risks that are retained by us are estimated, in part, by historical claims experience, severity factors and the use of loss development factors. The insurance liabilities we record are primarily influenced by the frequency and severity of claims and include a reserve for claims incurred but not yet reported. Our estimated reserves may be materially different from our future actual claim costs, and, when required adjustments to our estimated reserves are identified, the liability will be adjusted accordingly in that period. Our self‑insurance reserves for workers’ compensation, general liability and medical were $10.1 million, $1.8 million, and $0.9 million, respectively, at June 30, 2018 and $8.6 million, $2.5 million, and $1.1 million, respectively, at June 30, 2017. $6.4 million, respectively, for the fiscal year ended June 30, 2018; $4.8 million, $3.4 million and $7.7 million, respectively, for the fiscal year ended June 30, 2017; and $3.4 million, $4.0 million and $7.2 million, respectively, for the fiscal year ended June 30, 2016. Share‑based compensation—The Compensation Committee of our Board of Directors and, through express consent of the Compensation Committee, our CEO, are authorized to grant stock options and restricted stock awards from time to time to eligible employees and directors. Those awards may be service or performance based. We grant options with exercise prices equal to the market price of our common stock on the date of the option grant as determined in accordance with the terms of our equity incentive plans. The majority of the options granted prior to June 30, 2008 have a vesting period of one to five years and expire ten years from the date of grant. Options granted after June 30, 2008 typically vest over periods of one to four years with equal portions of the grant vesting on an annual basis and expire ten years from the date of grant. In accordance with U.S. generally accepted accounting principles, we recognize compensation expense at an amount equal to the fair value of share‑based payments granted under compensation arrangements. We calculate the fair value of stock options using the Black‑Scholes option pricing model. Determining the fair value of share‑based awards at the grant date requires judgment in developing assumptions, which involve a number of variables. These variables include, but are not limited to, the expected stock price volatility over the term of the awards, the expected dividend yield, the risk free rate, the expected term and expected stock option exercise behavior. In addition, we also use judgment in estimating the number of share‑based awards that are expected to be forfeited. Share‑based compensation expense was $3.3 million for the fiscal year ended June 30, 2018, $4.2 million for the fiscal year ended June 30, 2017 and $3.1 million for the fiscal year ended June 30, 2016. Income taxes—We account for income taxes using the asset and liability method. Under this method, deferred tax assets and liabilities are determined based on differences between financial reporting and income tax bases of assets and liabilities and are measured using the enacted tax rates and laws that will be in effect when the differences are expected to reverse. Deferred tax assets and liabilities are recorded in our consolidated balance sheets. A valuation allowance is recorded to reduce the carrying amounts of deferred tax assets unless it is more likely than not that such assets will be realized. In assessing the need for a valuation allowance, all available evidence is considered including past operating results, future reversals of taxable temporary differences, estimates of future income and tax planning strategies. We have elected to utilize the “with and without” method for purposes of determining when excess tax benefits will be realized. We are subject to income tax in many jurisdictions, including the United States, various states and localities. At any point in time, we may not be subject to audit by any of the various jurisdictions; however, we record estimated reserves for uncertain tax benefits for potential domestic tax audits. The timing of these audits and negotiations with taxing authorities may affect the ultimate settlement of these issues. If different assumptions had been used, our tax expense or benefit, assets and liabilities could have varied from recorded amounts. If actual results differ from estimated results or if we adjust these assumptions in the future, we may need to adjust our reserves for uncertain tax benefits or our deferred tax assets or liabilities, which could impact our effective tax rate. We had no off‑balance sheet arrangements as of June 30, 2018.
our new, additional distribution center in Phoenix, Arizona opened in the fourth quarter of fiscal 2016. We do not consider most merchandise purchase orders to be contractual obligations due to designated cancellation dates on the face of the purchase order. Commitment fees and interest on the Revolving Credit Facility are calculated based on contractual commitment fees, standby letter of credit fees, and interest based on the outstanding balance on the Revolving Credit Facility of $38.5 million and letters of credit totaling $9.5 million. See "—Liquidity and Capital Resources—Revolving Credit Facility" above. The interest and commitment fees on our Revolving Credit Facility reflect the future cash requirements for interest payments, assuming the $38.5 million outstanding balance is not repaid until maturity and incorporates the interest rates in effect as of June 30, 2018. The interest on the letter of credit utilization and unused commitments are fixed at 1.375% and 0.25%, respectively. The interest rate on swingline revolver borrowings is variable and is based on the prime rate plus margin, and was 5.0% at June 30, 2018. The interest rate on traditional revolver borrowings is variable and is based on either LIBOR or the prime rate plus margin, at our option, which was LIBOR for which interest rates ranged between 3.18% and 3.30% for multiple tranches. We have not included other long-term liabilities related to self-insurance reserves in the contractual obligations table, as they do not represent cash requirements arising from contractual payment obligations. While self-insurance reserves represent an estimate of our future obligation and not a contractual payment obligation, we have disclosed our self-insurance reserves under "Critical Accounting Policies and Estimates - Insurance and Self-Insurance Reserves."